Sports writer and columnist Mike Lupica wondered why Joe DiMaggio was so different from of the other retired immortals, why he and not Ted Williams, a man playing at the same time with comparable statistics and achievements, gripped the nation the way he did. Ron Swoboda, a former Yankeee player, perhaps answered Mike Lupica's ponderings best when he said, "(It is) very simple. Joe DiMaggio is what you get when you build mystique on top of greatness." Mystique-a sort of ambiguous word, implanting in those who read it a dualistic sense of its definition. It seems to suggest a fascination of some sort, yet, at the same time, it conjurs up notions of the unknown. It is a perfect word to describe Joe DiMaggio. The American public didn't "know" Joe DiMaggio in the 30s, 40s, and 50s, the way the American public "knows" professional athletes today. Granted there were no ESPN sports center highlights, nor was the media exposure hardly as extensive. However, America didn't really "know" Joe DiMaggio because he didn't let them know him, and because the American public was partially content in not knowing him. Because he was reserved and quiet, and kept his emotions to himself, Americans couldn't find fault in what Joe DiMaggio said or thought. Instead, everyday, they could invent their own "Joe DiMaggios" and imagine him as their ideal hero. Dixon Wecter, author of "The American Hero", claims that, in a Democracy, the hero is whom everyone wishes to be. Joe DiMaggio's personality allowd him to be a different hero for everyone. 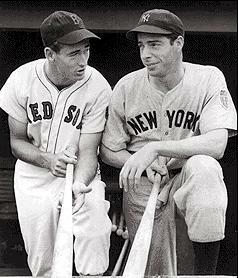 Said Jerry Coleman of his one time teammate, "Joe DiMaggio understood what it meant to be Joe DiMaggio. Not that that is such an easy thing to do. He had to be perfect every day. He had to be Joe DiMaggio every day." When asked about his unique image, Joe DiMaggio himself admitted he had never really been able to figure it out." I don't know where it (his image) comes from," he said. "I've often wondered. I'm still the same kid who played on the San Franciso Seal years ago. I feel like the same person. I don't think I've changed (Durso, 260)." Joe DiMaggio, poised and proper, was the symbol of the sobering and solemn thirties. And, the American public, searching for heroes in the decades of Depression and war, not only found DiMaggio, but also endowed him with the dimension of heroism (Durso, 260). So, who was the "real" Joe DiMaggio? The one that people perceived, or the one that played the part the people perceived? Did it really matter? People projected an image, and he grew into it. Lefty Gomez, a teammate and good friend, sums it up best..."The secret of it all, he knew he was Joe DiMaggio."